Based on the total scores from both Experimental 1 & 2 the tomatoes packaged in Continental Plastic trays with poly styrene film opened at the ends performed better than those in pulp and vacuum formed trays with stretch film and totally sealed. A recent Study reports Continental's Plastic Tomato Trays with open end poly styrene film wraps scoring up to 50% higher than pulp trays and 30% higher than stretch film wrapped vacuum packs. Tomatoes Tested & Scored for "performance"...firmness, ph(Acid) and color. Cornell's Food Science Department conducted extensive testing and evaluation of the variations of methods for packaging tomatoes for retail marketing. 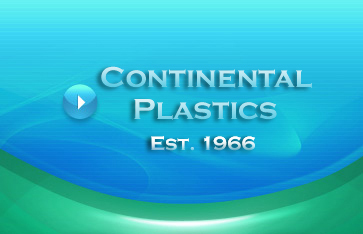 A comparison of packs for determination of shelf life included Continental's Plastic's open-type recyclable polystyrene trays, formed paper pulp trays and clear plastic trays. Mature green Florida tomatoes were commercially repacked and wrapped with several film types, including polystyrene film, meat wrap stretch film with vacuum pack and also breathable stretch film. Packaged tomatoes were held in an environment chamber at 65 degrees farenheight and 65% relative humidity under 24 hour fluorescent light. Duration of tests was set for nine days. Both the time and the test conditions were acceptable to agree satisfactorily with a typical retail produce department environment. The unique open lattice configuration of Continental's Tomato Trays when combined with a polystyrene film wrapping that is open at the ends* produced the best shelf life scores when compared to solid-based pulp trays or plastic trays that were fully encased in stretch film wrappings including vacuum packs. 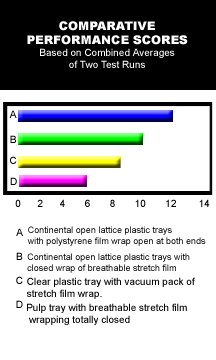 It would seem that the increased ventilation of circulating air contributes vitally to shelf life performance by use of open-end film wrapping and open lattice plastic trays.